Tennis elbow is an overuse injury that causes inflammation of the tendons that attach to the bony prominence on the outside of the elbow (lateral epicondyle). Your doctor will first recommend conservative treatment options to treat the tennis elbow symptoms. If conservative treatment options fail to resolve the condition and symptoms persist for 6 -12 months, your surgeon may recommend a surgical procedure to treat tennis elbow called lateral epicondyle release surgery. 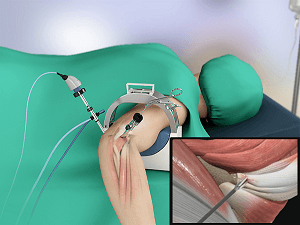 Your surgeon will decide whether to perform your surgery in the traditional open manner (single large incision) or arthroscopically (2 to 3 tiny incisions and the use of an arthroscope –narrow lighted tube with a camera). Your surgeon will decide which options are best for you depending on your specific circumstances.